This print is a mitate from Chūshingura ('The Storehouse of Loyal Retainers’), an epic story of a samurai vendetta based on an historical event. Led by the senior retainer Oishi Kuranosuke (1659-1703), the group of 47 men carefully bode their time, allaying enemy suspicions with frivolous behaviour, eventually avenging their lord by slaying the Daimyō Kira Yoshinaka (1641-1702) in Edo on the 14th December 1703. This became the subject of countless bunraku (puppet) and kabuki plays, and was frequently illustrated by ukiyo-e artists. 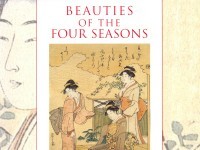 Kōmyō Bijin Mitate Chūshingura consists of celebrated beauties in twelve scenes from Chūshingura. This print shows the moment when a senior retainer, Kakogawa Honzō disguised as a komusō (a strolling priest) with a straw hat, arrives home to find his wife and daughter about to commit ritual suicide because he has determined to do so. This refers to act 9 of Chūshingura. 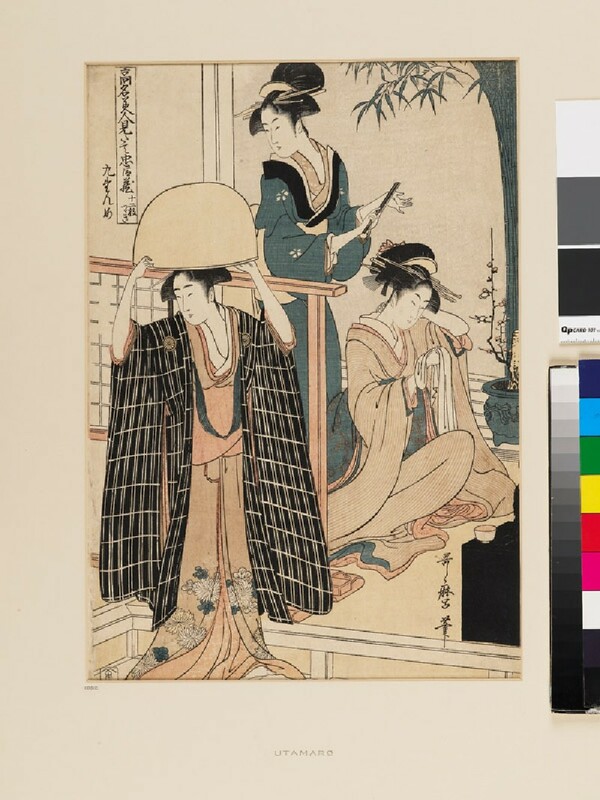 This series was issued during the same period and by the same publisher, Konoeya, as Gonin-bijin Aikyō-kisoi (Competition of Five Lovely Women) [see EAX.4721]. Interestingly, the same women seem to appear in both series; on the left Itsutomi of the Tomimoto as a komusō, Hiranoya of the Yatsuyama in the centre and Kisegawa of the Matsuba-ya on the right. There is a plum bonsai in a ceramic flowerpot probably implying ume-mi-zuki (plum viewing in February).